This Order was also founded by King Maximilian Joseph on the 19th May, 1808, and is of the same character for civil servants as is the Military Order of Merit for the military. "It is meant," according to the statutes, " to confer an honourable distinction on the servants of the state, and on the citizens of all classes of society who should have distinguished themselves by prominent virtues and merits." It consists of three classes : Grand Cross Knights, Commanders, and Knights. The three classes were originally to consist respectively of only twelve, twenty-four and one hundred members, but the number was subsequently (8th October, 1817) increased to twenty-four, forty, and one hundred and sixty, exclusive (in the first class) of those Knights on whom was at the same time conferred the Order, of St. Hubert. This Order, like the Military one of Merit, entitles the candidate to personal or hereditary nobility. The three degrees are conferred by recommendation of the Council of the Order. By the original law, the total funds of the Order were to be applied to the annual pensions of a certain number of members of all classes, but in 1824, the founder decreed that a part should be set aside for the support of twenty children of the members of the three classes, each to the annual sum of 250 fl. (£25). King Louis (1834) increased that sum to 300 fl. (£30), and the number of the recipients (1835) to thirtyeight. 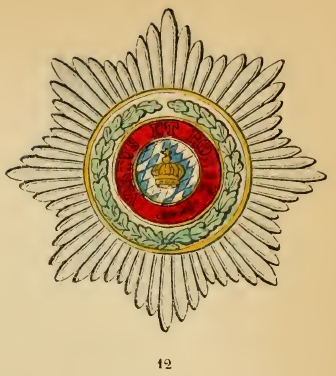 The decoration consists of an octagonal white enamelled Cross, encompassed by an oak wreath under a royal crown. The middle of the obverse contains a golden crown upon white and blue rues, with the legend in golden letters within a red ring : "Virtus et Honos" (Virtue and honour). The reverse shows the effigy of the founder, with the inscription : "Max. Jos. Rex Boyvarise" (Max Joseph, King of Bavaria). This large Cross (Nos. 13 and 14) which differs in size with the various degrees, is worn suspended by a blue watered ribbon, with narrow white borders, by the Knights at the button hole, by the Commanders round the neck, and by the Knights of the Grand Cross across the left shoulder towards the right hip. The latter wear, in addition, upon the left breast an embroidered star (No. 12). No. 22 represents three links of the middle part of the chain, the central link of which contains the initial of the founder. The oval intervals contain alternately the initials of the motto : "Virtus et Honos".